A 17-year-old male with achondroplasia presented to his primary care physician with a three-month history of intermittent dry heaving/gagging, early satiety, and pain with deep inspiration. The patient was placed on a proton pump inhibitor with no significant relief. Initial chest radiograph and barium swallow examination were normal. 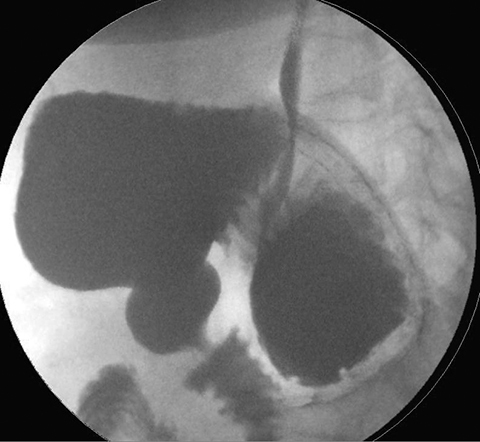 A 5-year-old female with history of gastroschisis presented to an urgent care facility with two days of abdominal pain, without emesis or diarrhea. Initial evaluation included normal laboratory results and a normal abdominal radiograph leading to the patient’s discharge home. Three days later, the patient presented to the emergency department with intractable abdominal pain, vomiting, poor oral intake, and dehydration. Frontal (Figure 1) and lateral (Figure 2) upper GI (UGI) images of the 17-year-old in Case 1 demonstrate an abnormal superior location of the greater curvature. The fundus projects partially below the gastroesophageal junction and the antrum above the duodenal bulb. There was delayed emptying noted. The patient was admitted for laparoscopic gastric detorsion of organoaxial volvulus and anterior gastropexy. 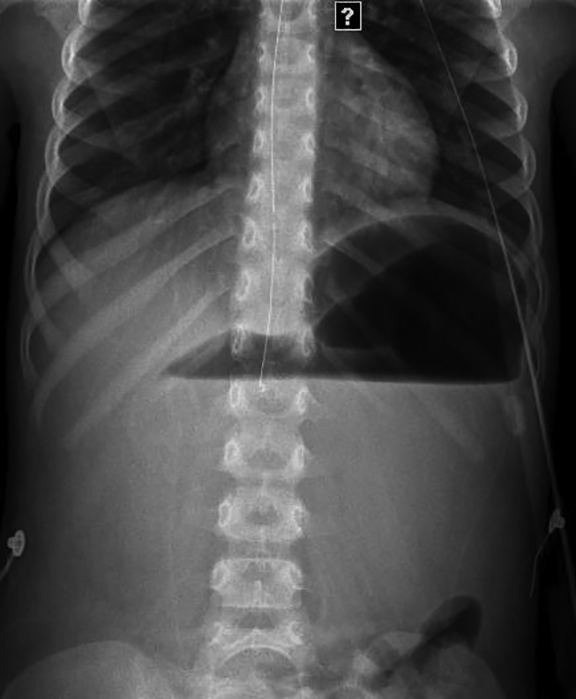 Abdominal radiograph (Figure 3) of the 5-year-old in Case 2 demonstrates an air-fluid level in a distended stomach. A nasogastric tube (NG) could not be passed into the stomach. After fluoroscopic placement of an NG tube an upper GI exam was performed. A severely distended, obstructed stomach was demonstrated (Figure 4). The pylorus was located above and to left of the esophagus. This is consistent with mesoenteroaxial volvulus. Emergent laparoscopic surgery demonstrated a fold across the axis of the lesser/greater curvature. This was detorsed and anterior gastropexy performed. Diagnosis for both cases is gastric volvulus. Differential diagnosis in the work up of gastric volvulus should include other causes of upper intestinal obstruction, such as midgut volvulus. There are two main axes of gastric volvulus. Organoaxial volvulus (Case 1) is exemplified by twisting of the stomach along its long axis, where the greater curvature flips anteriorly or posteriorly (like a hammock) while the gatroesophageal and gastroduodenal junctions remain relatively fixed.3 Mesoenteroaxial (Case 2) is the less common form of volvulus. The gastroduodenal junction mobilizes anteriorly and superiorly lying to the left of the gastroesophageal junction.3 This folds the stomach along its short axis and conceptually generates a 180-degree twist at both junctions, essentially a two transition point closed loop obstruction. There are gradients of acuity and presentation of gastric volvulus. Organoaxial volvulus can be partial and intermittent presenting with more vague or chronic symptomatology,2,3 such as poor feeding, nonbilious emesis, abdominal pain and gastroesophageal reflux, all of which are common indications for UGI exams. Findings that may raise suspicion on plain film include a large spherical gastric bubble, elevated hemidiaphragm or abnormal course of a nasogastric tube, but plain film findings are often nonspecific. Upper GI is the diagnostic exam of choice3. On upper GI, the axis can be determined as well as the level of gastric inlet/outlet obstruction. CT examination may be helpful in a case of severe gastric inlet obstruction or evaluation for heterotaxy. Treatment of acute gastric volvulus is emergent, as ischemia and subsequent mortality is of concern. 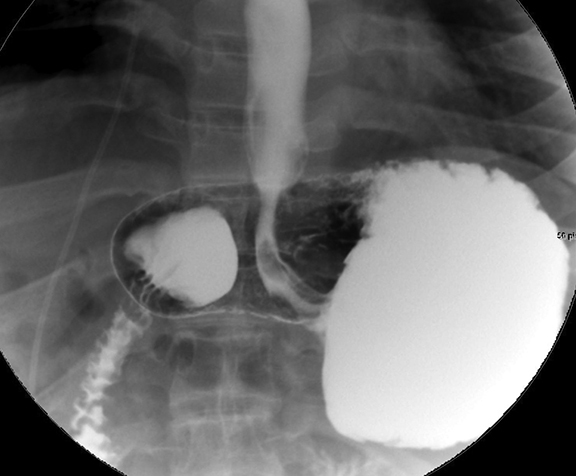 Chronic/intermittent gastric volvulus may be treated non-emergently. A common surgical approach is laparoscopic reduction with gastropexy of the greater curvature to the anterior abdominal wall. This was done in both cases presented here. 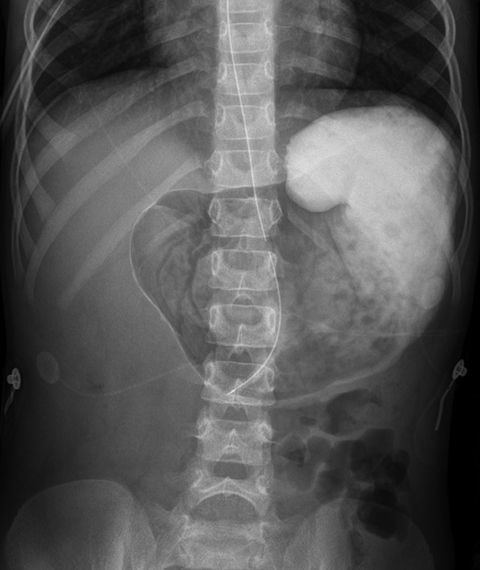 Gastric volvulus has a broad clinical presentation, which can be acute or chronic with vague symptomatology. The two main axes of volvulus are organoaxial and mesoenteroaxial, the former being more common in the pediatric population1 and more likely to present as chronic/intermittent.3 During workup, an UGI may be the first test performed to demonstrate and diagnose gastric volvulus. Recognition and communication of these findings, especially in acute cases requiring emergent surgical reduction, can stem significant morbidity and mortality. Gerstle JT, et al. Gastric volvulus in children: Lessons learned from delayed diagnoses. Semin Pediatr Surg. 2009;18(2):98-103. Cribbs RK, et al. Gastric volvulus in infants and children. 2008;122(3):752-762. Oh SK, et al. Gastric volvulus in children: The twists and turns of an unusual entity. Pediatr Radiol. 2008;38(3):297-304. Prepared by Dr. Beydoun, while a Pediatric Interventional Radiology Fellow; Dr. Dao, while a Pediatric Radiology Fellow; Dr. Jorgensen while a Pediatric Radiologist, and Dr. Richard Towbin while a Pediatric Radiologist, in the Diagnostic and Interventional Departments of Radiology at Phoenix Children’s Hospital, Phoenix, AZ, and by Dr. Alexander Towbin, while a Radiologist in the Department of Radiology at Cincinnati Children’s Hospital, Cincinnati, OH.